In congruence to the vision of the founder Dr. N. Mahalingam, a majestic Swami Vivekananda statue which is 6 feet tall kept above the platform of 5.5 feet is erected in front of Dr. Mahalingam Vigyan Bhavan today at 9:30 am. This is indeed a milestone to the Kumaraguru Institutions. 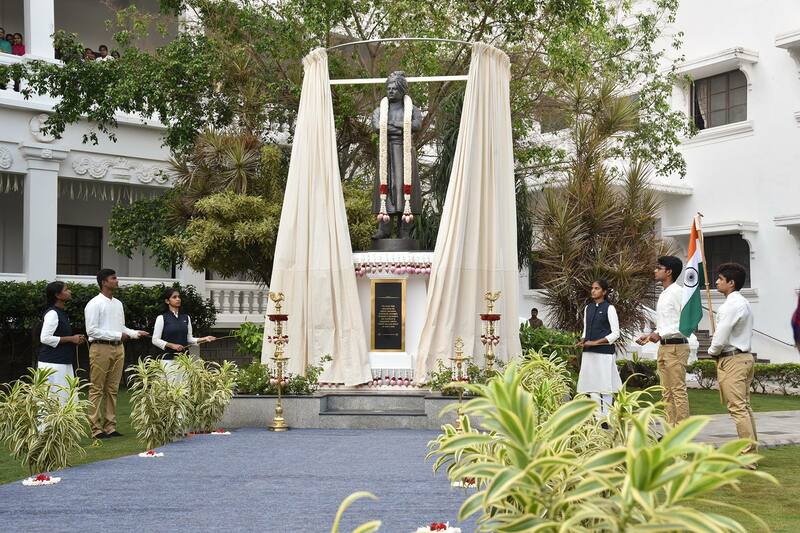 Swami Vivekananda believed in the youth of the nation and in accordance to this the statue of Swami Vivekananda Statue was unveiled by 6 students representing the entire Kumaraguru community. Swami Nirmaleshananda, Maharaj of Ramakrishna Mission, Coimbatore was the chief guest of this solomen occasion and he delivered an awakening message to the gathering of 600 students and staff members. With him were present the President of Kumaraguru Institutions Mr Shankar Vanavarayar, Chairman, Dr Krishnaraj Vanavarayar, Correspondent, Mr M. Balasubramaniam garlanded Swamiji and Principal, J Dr.Senthil. In this unveiling ceremony, more than 600 students and staff members participated to express their commitment to becoming and building an empowered youth and thereby empower the nation. President of Kumaraguru Institutions Shri. Shankar Vanavarayar welcomed the august gathering. In his welcome message he shared that Swami Vivekananda’s statue in the campus is made present for Kumaraguru community to get remembered and inspired by his life, every morning when we walk in for the day’s duties. Dr. Krishnaraj Vanavarayar, Chairman presided over the event and his message was that how following Swami Vivekananda teachings when followed by the youth will turn them into individuals of wisdom, with evolved inner being and a mission. He emphasized the need for the youth to seek human excellence while they attend to their academic excellence and said following Swami Vivekananda is the way to practice human excellence. Swami Nirmaleshananda Maharaj of Ramakrishna Mission, Coimbatore gave an awakening message on the significance of Swami Vivekananda’s teachings. He mentioned about Swami Vivekananda’s Chicago speech at the World Parliament of Religions in 1893 and five of his discourses that followed his Chicago speech awakened the world to the truths about religion, brotherhood and oneness. Students representatives who unveiled the statue.